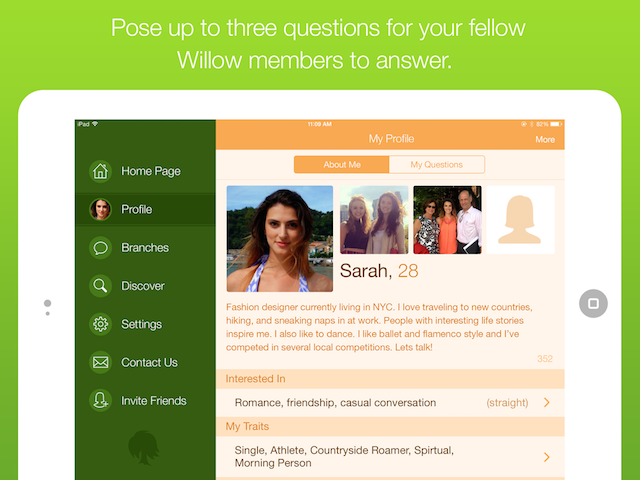 Social networking and dating app Willow has officially launched out of beta as a “revamped” version of the platform. The app allows users to connect with others for casual conversation or romantic intentions, and focuses on meaningful conversations rather than photo-sharing and quick judgements of others. When using Willow, users create three custom questions to add to their profile, which other users can answer to trigger an instant connection. When looking for a match with another person (for friendship or otherwise), users receive the other person’s profile information, including a short biography, but will not see their photo. Users can answer or skip any of the connection’s profile questions, and when a question is answered, the original user can choose to chat with the other person. Conversations can progress indefinitely through this semi-anonymous interaction, or users can mutually agree to reveal their photos. Users can find matches and organize their conversations based on intentions, gender and age range. Matches can also be filtered by distance, so users can chat with only others nearby, or with those around the world. Finally, users can search for specific profile questions, or create their own question categories using hashtags. I created Willow to put the “social” back in “social media” by stressing conversation and encouraging honest connections. Social media should promote communication, not detract from it. Getting to know someone is a lot more complex than swiping one way or another, and Willow reflects this nuanced nature of human interaction. Willow is available to download for free on the iTunes App Store, and is coming soon to Android. Over 100,000 users downloaded Willow during its beta period, with the app seeing 110 percent growth month-over-month during its testing period.